Prototypes have already been built and tested delivering packages to remote farms in Queensland, Australia. The tests were conducted in Australia because that country has more open rules about drone use, the BBC said. Farmers there received candy bars, dog treats, cattle vaccines, water and radios. 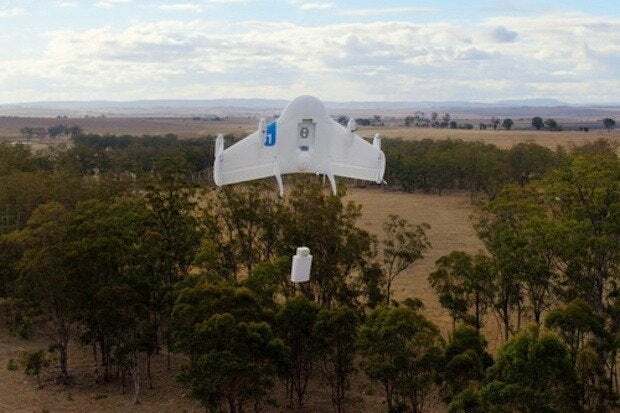 Eventually, Google might use the drones for home delivery of items that people purchase online, according to a company spokesman. Google has been working to expand its Google Shopping Express service, which right now uses cars for deliveries. Amazon kicked off the delivery-by-drone craze in December, when it said it was testing the use of unmanned aircraft for sending packages to customers, though some people didn't take the idea seriously at the time. Having unmanned vehicles buzzing around towns delivering packages seems like a radical and potentially dangerous endeavor, but Google's involvement further validates the idea. The company stressed that these are early days for Project Wing and it might be years before testing is complete. For the next year, Google will focus on the safety system for the drones, teaching them to navigate around each other and handle events like mechanical trouble. Moreover, Google said, "we have to fly efficient delivery routes" that take into account the public's concerns about noise and privacy violations and don't threaten "the safety of those on the ground." Ultimately, the company said, "we have to be good enough to deliver to an exact spot the size of a doorstop."